Artist Randall LaGro, Randall LaGro paintings, Randall LaGro monotypes. "...shaping form from chaos, pulling lights out of darkness, inviting viewers to open the door to their wanderings, imaginations and dreams." With a growing list of dedicated collectors, Randall LaGro plumbs the depths of his own intuition to create contemporary paintings of remarkable intimacy – no matter their size. You want to look, and look again, at a LaGro painting as your eye finds veiled images beneath layers of paint; human and animal forms may appear or recede before abstract elements of interwoven texture. The slightest detail observed can change your interpretation of these subtly complex, often mysterious and surrealistic paintings. For Randall LaGro the very first strokes or washes of paint contain the key to what will follow: A genesis of un-sketched detail emerges from this initial color to inform the direction of a painting. From here the seed of a concept grows until elements of the artist’s experience and technique are called upon to bring a new contemporary painting to fruition. LaGro prefers washes and fast, expressionistic strokes, occasionally working sand or mica into the paint, often impressing patterns into wet paint with lace or linen, or “drawing” on the canvas with one of his myriad tools. In all work by Randall LaGro there is a metaphorical interplay of conscious and unconscious levels of reality. “I’m striving to address the everyday guy as well as painters, poets and philosophers,” Randall LaGro says. In this he succeeds. His expressions of rawness and heart create an elusiveness into which each viewer must bring his own experience. Works by Randall LaGro can be found in museums and collections across the country. His many awards span two decades from the Best of Show, Fremont [CA] Art & Wine Festival, 1988 to the Patricia Norman Cash Award for Works of Distinction, National Biennial, Los Angeles Printmaking Society, 2001 and First Place, National Small Print Show, Creede, CO, 2013. His surrealistic contemporary paintings can be seen in the 2014 book Contemporary Art of the Southwest by E. Ashley Rooney and Julie Sasse. "I am trained first as a painter and the monotype, in its essence, is simply a painting, painted on a metal or Plexiglas plate then transferred by laying paper over the plate and running it through an etching press. Although technically called a print because of the transfer, it is unique among print mediums in that it’s a one-of-a-kind art piece. "I wanted to create monotypes that had some of the qualities and plate tones found in etchings, lithographs and even photographic tines. At the same time, I was interested in the psychological gravity that I feel comes with monochromatic color. 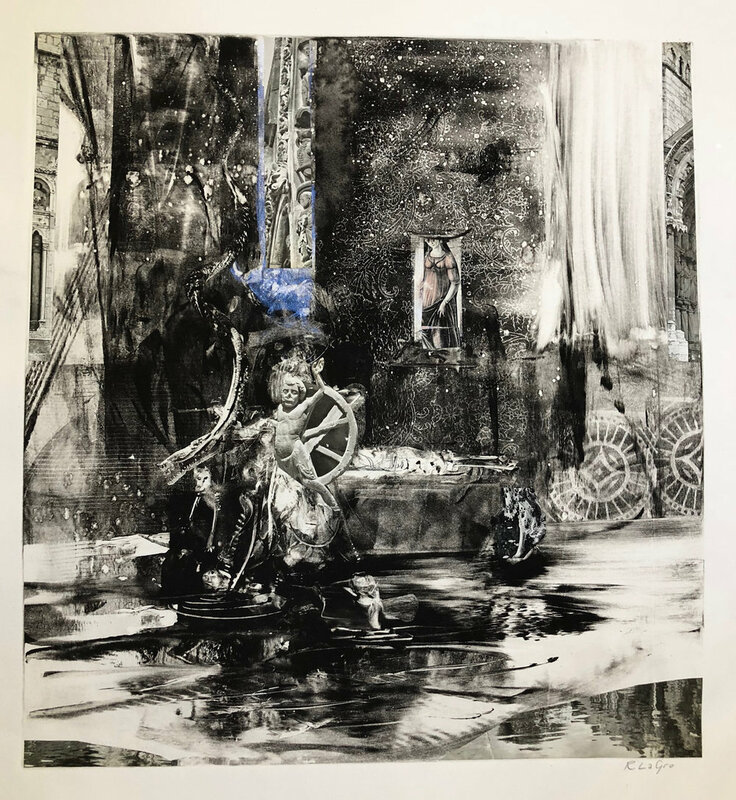 "Working with my own mixed blacks or a variety of brown tones reminiscent of the turn of the century sepia tone photographs, I begin by laying a thin layer of ink on the Plexiglas with a rubber roller. I work intuitively, drawing from the well of the subconscious, wiping ink away which when printed will be the white of the paper. Developing my own tools when necessary, I use brushes, Q-tips, rags and my fingers, making marks, then pulling away seeing shapes appear and finishing an image, shaping form from chaos, pulling lights out of darkness, inviting viewers to open the door to their wanderings, imaginations and dreams."